There are a handful of things that I have pretty much hated to eat my entire life, that I’ve now come to love. Runny eggs, yogurt, and cabbage…just to list a few. It really is a strange and neat process of how our taste buds change so much throughout our lives. And luckily, I have a husband who loves to try new foods and eats almost anything. Every week we try something new and usually I am over the moon (and full) with what we cook. Justin found this particular recipe and although it was a hard sell on me at first, I’m so happy he was persistent in how much he thought I would like it. It’s spicy without being spicy. It’s healthy and unhealthy at the same time. It’s meaty and saucy all at once. It’s delicious. The recipe itself may look a bit lengthy and intimidating, but I promise you it’s all worth the effort and then some. This recipe has been adapted from Nasma Haider at CrumbsandTales.com. Fill a large pot with water and add 1/4 cup of salt and 1/4 cup of white vinegar and bring it to a boil. Remove the core of the cabbage and boil it whole for 15 to 20 minutes. Once the cabbage is done, carefully peel off the leaves (the cabbage will be hot!) and allow them to cool. Cook your rice according to directions and set aside. In a saucepan, melt the 2 tablespoons of butter and add in the diced red onion. Saute the onions for about 10 minutes on medium heat until they’re softened. Add in the 2 teaspoons of garlic during the last two minutes. When it’s done, set the onion mixture aside to cool. In a large bowl, thoroughly combine the cooked rice, ground beef, egg, salt, pepper, paprika, cayenne, dried herbs, and the onion mixture. Roll the mixture into 8 equal-sized, oblong meatballs. Place each meatball in the center of a cabbage leaf, wrapping the leaf around it like a parcel. Line a 9x13 dish with the cabbage leaves that you did not use, ensuring that the entire surface and sides of the pan are covered with cabbage leaves. This will prevent your rolls from sticking to the dish and burning. 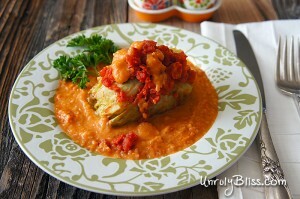 Place your cabbage rolls, seam side down, to make sure they don’t open up while baking and pour on the diced tomatoes. 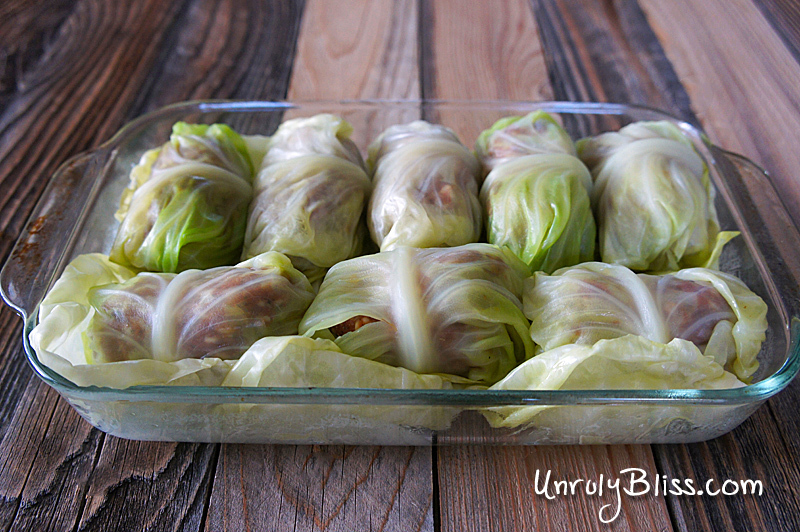 Finally, use the left over cabbage leaves to cover the top of the rolls to protect them from burning during baking. Again, make sure the entire surface is covered. Bake the rolls for 1 hour and 20 minutes. Add the coarsely chopped white onion to a food processor along with 1/4 cup of water. Puree the mixture until the sauce is completely smooth (no chunks!). In a large sauce pan, heat 1/4 cup of butter and add the pureed onion mixture. Cook the mixture on medium heat for 2-3 minutes. Add the minced garlic and cook for 1 minute more. Whisk in the flour and make a roux (a mixture of flour and fat that is cooked to thicken sauces). The mixture will get a bit gooey, but just keep whisking. 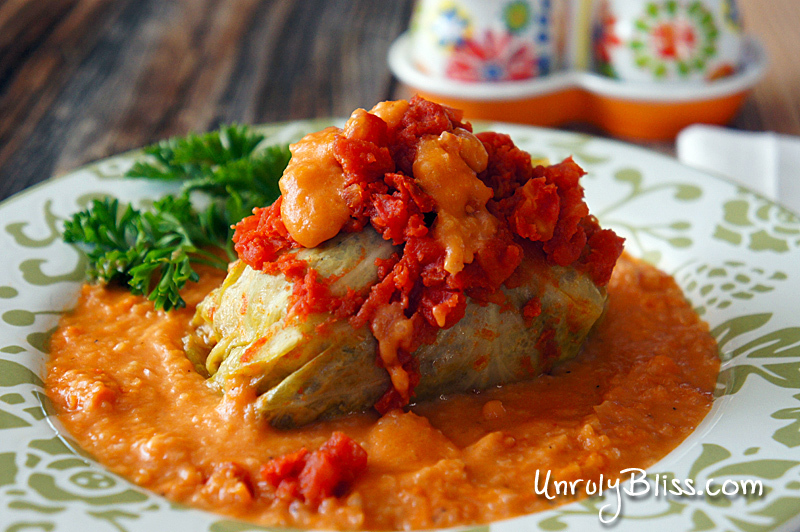 After a minute or so, add in the tomato sauce, whisking vigorously to remove any remaining lumps. Add the chicken stock, cream, salt, and pepper. Continue to cook the mixture for 3-4 minutes until it starts to bubble and thicken. Once the cabbage rolls are finished baking, remove them from the oven and carefully peel away the burnt pieces of cabbage from the top. Serve each cabbage roll warm, topped with sauce, diced tomatoes, and parsley (to make it even prettier).